I fell in love with Panera's pasta dishes! My kids and I enjoy eating there when we can, but I try to keep a tight budget so we can't always eat there. 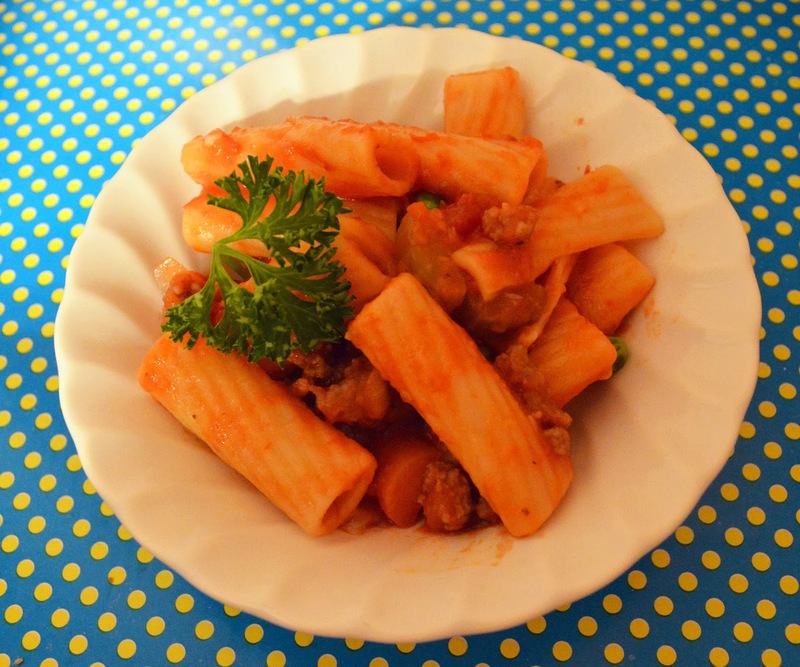 I decided to try to copy cat their rigatoni dish at home. What I ended up with is quiet yummy! I chose to use turkey sausage in my recipe but you could definitely use pork as well. I believe the Panera dish uses a spicy pork sausage. Also, I dialed down the spiciness for my kiddos but you could make it as spicy as you want. Brown your sausage. If using turkey or other low fat sausage, add a little oil or butter to the pan. I also seasoned my turkey with a little Italian seasoning and crushed red pepper. Drain and set to the side. Warm olive oil in sauce pan. Saute onion, carrot, celery and garlic until it just starts to soften. Add crushed tomatoes, red pepper and basil, cover and simmer for about 30 minutes or until veggies are soft. Stir in butter, peas and parsley until heated through. Toss with sausage and pasta.